I have a secret love affair going on…actually, it’s probably not all that secret. And my husband fully approves. I lurrrrrv me some wood grain! On old doors, on tabletops, on walls, ev.ery.where. …and I instantly had heart eyes. I didn’t have much use for these wooden boxes as they were, but all I had to do was give them the same treatment I gave my DIY herb garden crate from last summer. 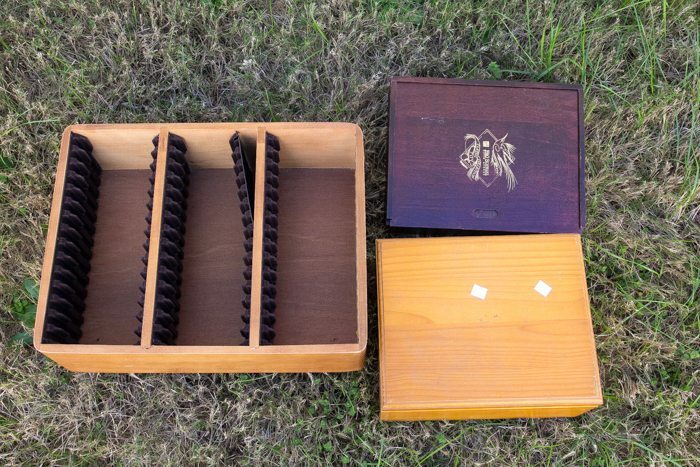 I gave them a good sanding with my mouse sander, and they looked instantly like vintage wine crates. Then, on a whim, I decided I was ready for a change on our living room bookcase that I originally found on Craigslist. Lately, I’ve discovered I like a little bit of drama, as in the high contrast kind. So I grabbed a paint brush and a bottle of Fusion Mineral Soapstone and went at it. Fusion Mineral Paint was so nice to provide me with the paint. I put two coats on the back of the bookcase, added my freshly sanded thrift store boxes along with lots of greenery, old books, and a few hand-me-down family items, and I ended up with this! 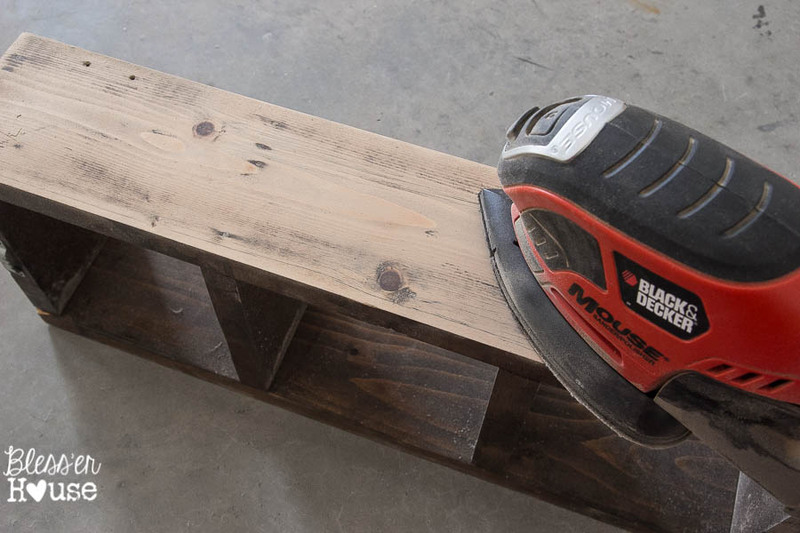 The dark bookcase backing definitely gave it the oomph it needed. The bookcase sort of disappeared on the back wall of our living room before, and now it has really added some interest to that corner. And since we’re in the middle of winter, it’s nice having all of this livened up greenery… even if it is all fake. I grab one or two artificial plants every once in a while at Ikea and HomeGoods, and over the past couple of years, they’ve added up to a pretty big collection. Oh, and I found that big wire birdcage at the thrift store for $10 too. Yay! Score! So what do you think? Are you a fan of drama? Or have a love affair for wood grain too? Later this week, I’ll have a little sneak peek of the happenings in our master bedroom makeover progress. I cannot WAIT to share! Thanks, Tina! I’m excited how it turned out! 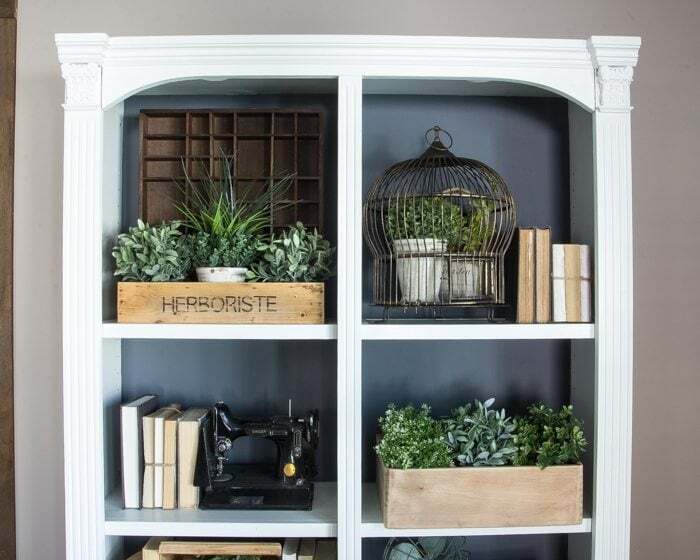 Your bookcase turned out fantastic.The color choice on the interior is genius, it reallys pops and your stacks of vintage books paired with the wooden crates and succulents is perfect. It’s like I’m watching a clip from “Fixer Upper.” lol!! I love it, you are inspiring us all, girlie. Have a blessed day!!! Oh goodness, Sherri, you just paid me the biggest compliment ever to even think this is similar to Fixer Upper. Thank you! Haha! You are too sweet. Hope you have a blessed day too! Love that paint colour at the back of your bookcase. Your plants don’t look fake! . It’s nice to change things around in January- you have great vision. Thank you, Shirley! I really like the Ikea ones because they do look fairly real considering how inexpensive they are. I kill any live plant that ever dares to enter our house…black thumbs McGee over here. Love the new look! The wood, the greens, the paint. All beautiful! I live in wine grapes area and have a crush ( oh…that was not on purpose I chose that word!!) on the old grape boxes they haven’t used in years. They are selling locally by truckloads!!!! And it’s like–when they are gone, they are gone. As a kid I picked grapes one summer. The boxes are too big to really use indoors but we’ve already used at Christmas to hall stuff! But the wood!! There’s even a square of chalk paint on one end of the crate they’d write the row and something else. So neat. But I’m going to use them somewhere!!! Because you’d just love the wood?? It’s a lovely result for the bookcase, I hope you don’t mind me asking though – the painted back was tongue and groove wood in the ‘before’ picture and now appears to be smooth – did you change the wood on the inside back before you painted? and if so, what with? The whole look comes together really nicely but I am a stickler for detail! Actually, the tongue and groove look was a little optical illusion. I had just painted thin gray stripes on the back the first time to make it look more textured. 😉 It was always smooth though. thanks for replying, the tongue and groove effect was clever and has inspired me for a future project, I would not have thought of it!. the end result for the makeover colour contrast is beautiful though. 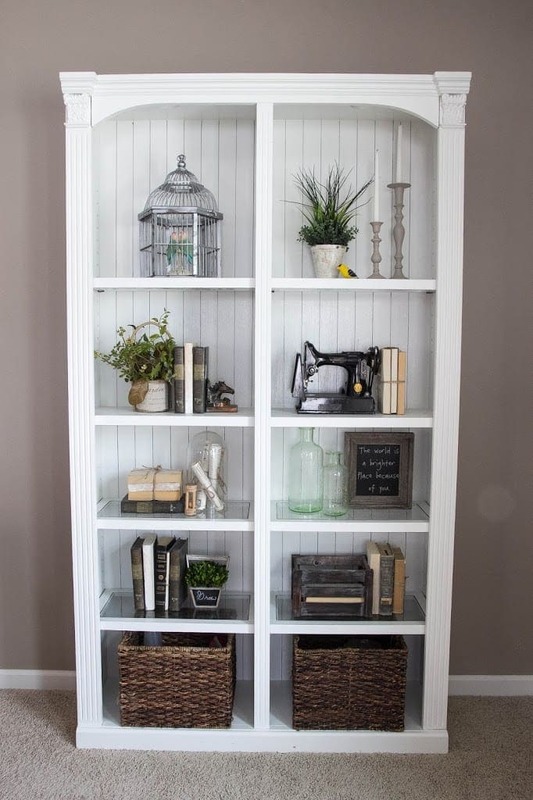 LOVE your bookcase and how you have filled it! Looking forward to more of your ideas in 2016! 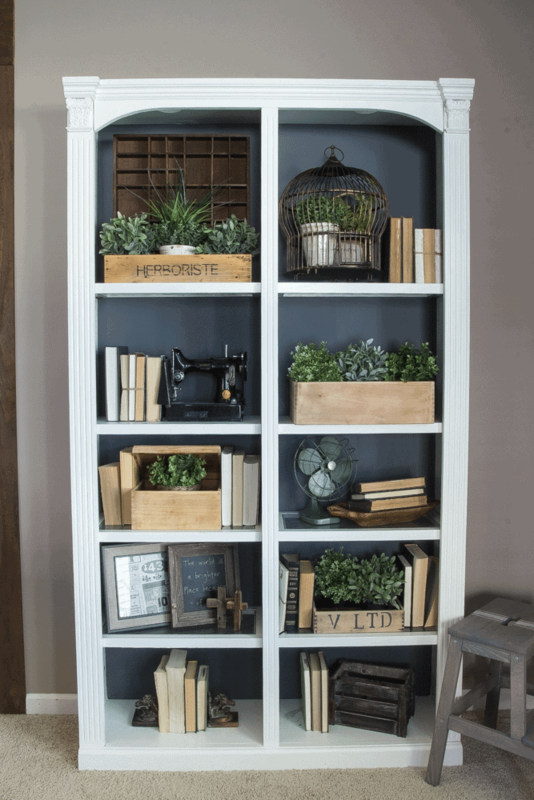 Hi there – I love bookcases!! Are these 2 book cases put together, it just one. Looks like it could be 2. Hi, Wendy! It’s just one bookcase, but it has two vertical sections, so it does sort of look like two separate ones. I loved both versions of your bookcase. But the color you painted on the inside this time around is gorgeous. I think you may have inspired another project for me my dear. 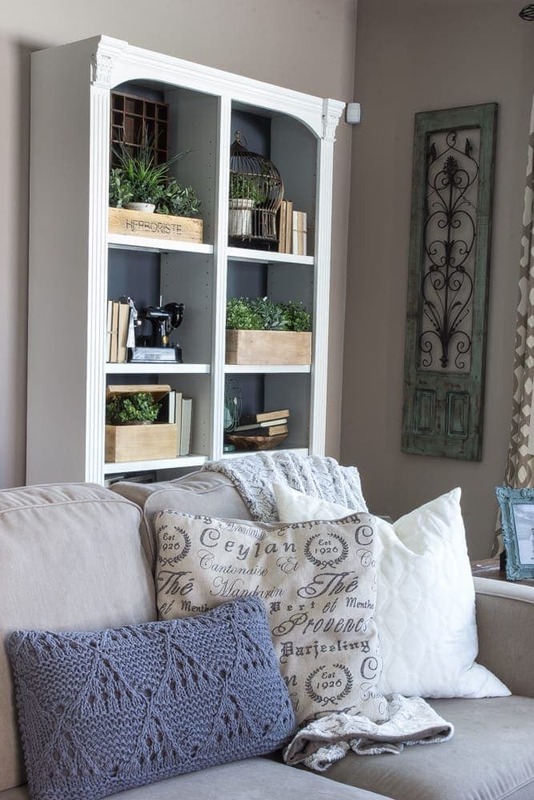 And I love how you styled the bookcase this time around. Thanks for all the great inspiration!! Yay! Awesome! I was kind of scared to paint it, but I’m glad I did. Worth the risk. 🙂 Thanks, Hope! Such a great look, I love the contrast 🙂 it looks modern and vintage with the crates! Good job! Aw thank you, Maria! You are too sweet! I’m sure it’s tough to find good thrifting places in a foreign country. Definitely an adventure though! I am s excited to have found your log! 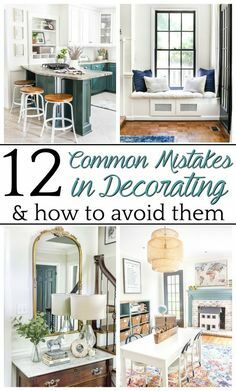 You give me hope for all of the decor I want and can’t afford and can now DIY! I am on a tight budget so this is so inspiring! Keep up the awesomeness and God Bless! P.S. 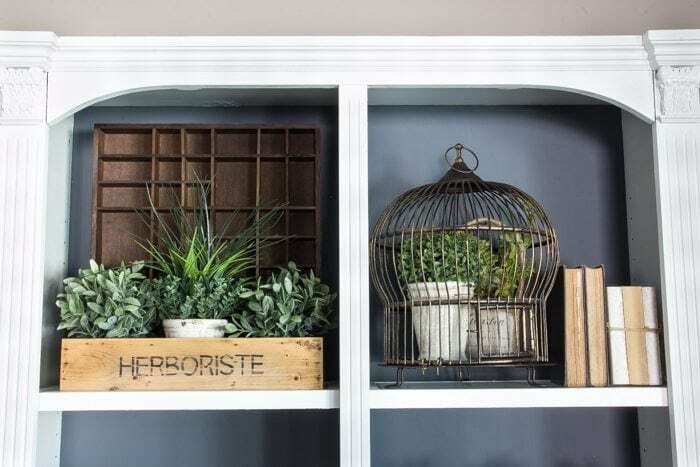 Where do you find all of your greenery that you have on your bookcase? I love the small, artificial plants. That’s going to go on my “Keep an eye out at Homegoods” list. 🙂 I have to smile going through all the pictures on your website. 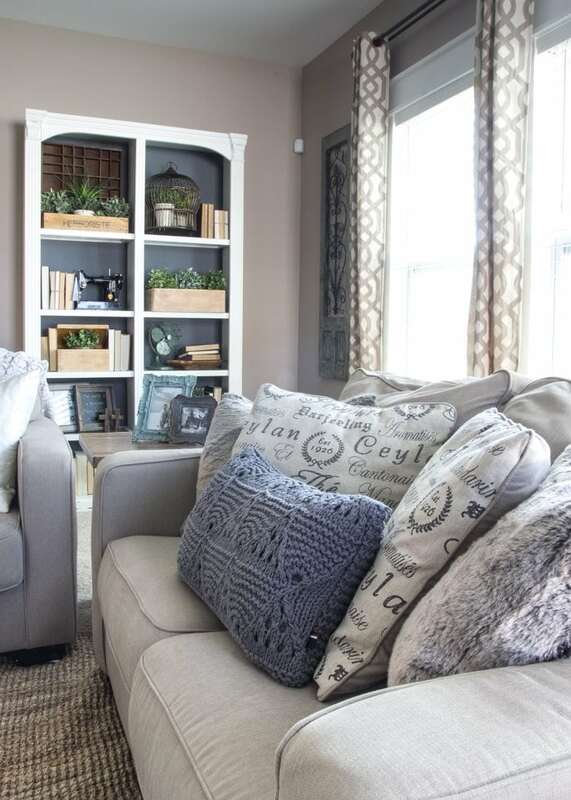 I keep seeing the tea-themed throw pillows on your couch; I have the same pillows, with a dark gray back to match our love seat. Curious what two colors you uses when creating this piece? I’m not familiar with Fusion Mineral and curious to learn more. I typically use Annie Sloan chalk paint but really like the variety of colors offered by Fusion Mineral. Thank you!